Annawandi, “a sumpy plug of slum,” is tucked between the Mumbai airport and a fleet of luxury hotels, a rejoinder to the story of the “new,” prospering India. Here on reclaimed bog land, Pulitzer Prize-winning journalist Katherine Boo spent a little over three years among 3,000 squatters packed into 355 shanties to produce Behind the Beautiful Forevers. This is a stunning piece of narrative nonfiction; it not only reports on some of the world’s poorest people and their dizzying resourcefulness and criminality but portrays them in all their humanity. 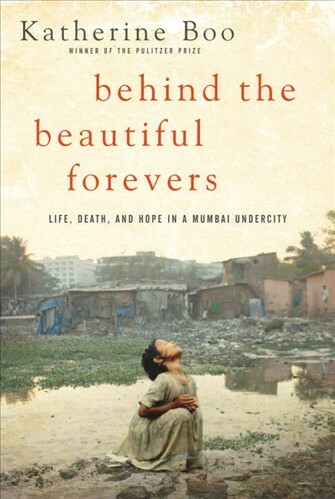 There’s a brothel owner and goat keeper who can’t keep either of his quarries in line; an ambitious woman named Asha who’s trying to jump-start her career in corruption; and, most memorably, “One Leg,” a Mumbai mother with, yes, one leg, who’s notorious for a “sexual need as blatant as her lipstick” and who’s not above setting herself on fire and framing her neighbors for the crime. Boo’s prose is electric as she illustrates, with affection, the contradictions of this Annawandian community—the enviable kinship, the casual backstabbing, the drive to survive; in one heartbreaking scene, a boy steals the sandals off his sleeping father’s feet and sells them for food. Even more impressive is how Boo explores the most difficult question of all: In a country booming with development, what keeps these slumdwellers so poor?